Effective healthcare delivery is a vital concern for citizens and communities across the globe. The numerous facets of this industry require constant re-evaluation and optimization of management techniques. 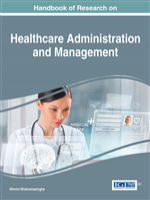 The Handbook of Research on Healthcare Administration and Management is a pivotal reference source for the latest scholarly material on emerging strategies and methods for delivering optimal healthcare opportunities and solutions. Highlighting issues relating to decision making, process optimization, and technological applications, this book is ideally designed for policy makers, administrators, students, professionals, and researchers interested in achieving superior healthcare solutions.